The longing for values, for what is genuine is becoming ever greater in a digitized world in which networking and mechanization are becoming overpowering. In our personal environment, this is reflected in the search for the elegantly simple: people want to be surrounded by things which communicate calm, clarity and concentration on the essential. 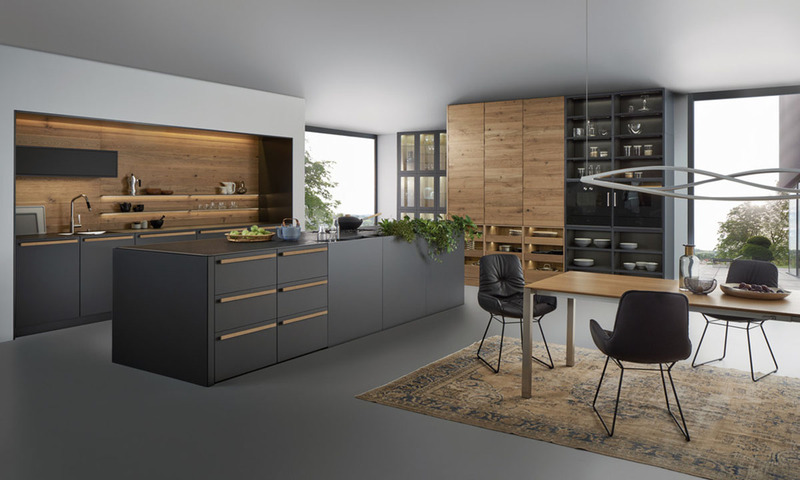 In conjunction with VALAIS LEICHT developed the new planning concept EVO.The seamless transition from worktop to fronts is sensational: the virtually invisible worktop with its surrounding metal edge has a flush finish with the fronts and gives the kitchen an exceedingly puristic air. The material mix too makes the ensemble all the more exciting: structured genuine wood meets velvety matte lacquer, the warm tone of the wood meets the cooler air of the carbon grey – a skillful combination of contrasts, also essential in the new planning concept. You must be <a href="https://lussocucine.nyc/wp-login.php?redirect_to=https%3A%2F%2Flussocucine.nyc%2Fkitchens%2Fleicht%2Fvalais-collection%2F">logged in</a> to post a comment.